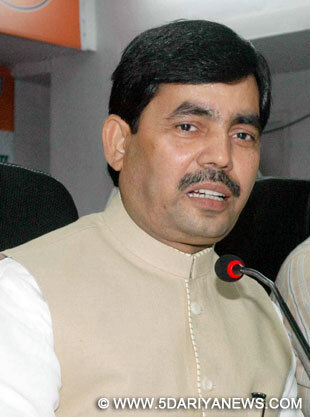 The Bharatiya Janata Party (BJP) Thursday accused the Haryana Janhit Congress (HJC), led by Kuldeep Bishnoi, of working as the 'B' team of the ruling Congress party in Haryana.HJC president Bishnoi was attempting to pide the anti-Congress vote in the upcoming state assembly election, BJP national spokesperson Shahnawaz Hussain told media here.Haryana will elect a new assembly most probably in October. "By snapping ties with the BJP, Bishnoi is going to work as a 'B' team of the Congress and help Haryana Chief Minister Bhupinder Singh Hooda," Hussain said.He, however, expressed hope that the BJP will still do well in the election. "People of Haryana are ready for a change. There is a wave for change. Having seen how prime minister Narendra Modi has ushered change in the country and working for development, people of the state are ready to walk along with the BJP, so that the pride of Haryana is restored," he said.He said the BJP won seven of eight Lok Sabha seats it contested in Haryana and by snapping the ties the HJC showed that it had no respect for people's choice.Accusing the BJP of betraying him, Bishnoi Thursday announced the end of his party's alliance with the BJP. "The BJP continued to betray me constantly. We tried to keep the alliance but (failed). We hoped they (BJP) will change but they did not. We are pulling out of this alliance," Bishnoi said in Chandigarh.